I’ve been seriously considering getting either a smart watch or a fitness band. I have basically no experience with the bands (and only limited experience with smartwatches) so I wanted to get a couple of the top sellers and compare them side by side. Unpacking the FitBit led me to immediately go online, download their software and create an account. I had the option of signing in using an email, signing in with Facebook or with my Google Account. Then it asked a lot of personal questions – name, birthday, gender, height, weight and time zone — to “improve” my experience. 🙁 There was no opt-out on this. I charged the FitBit by removing it from the band and sliding it into a USB, short-cord, dongle style charger carriage (it was already partially charged, so I had enough juice to begin testing). I slid the bit back into the band and struggled with the clasp for a minute (are my fingers REALLY that weak?) before everything was in place. The clasp seems really secure — once you get it on, which is no simple task. I plugged in the wireless sync dongle into my computer and let it search until it found the flex. All this was done with “step-by-step” illustrated instructions on the program installed on my computer. I tested the flex, it buzzed and I was informed that the flex would automatically sync any time I was within 20 feet of my computer. And that was that. I installed the official app for my android phone and turned on Bluetooth to sync. The packaging indicated that the UP 24 was only compatible with Apple products, but in the small print there was a link to check for devices. Thankfully my Note 3 was one of the android devices that worked. I created an account online from that link and downloaded the software to my computer that I needed. While that was going on, I downloaded the app for my phone. I find it appalling how much information access such apps require to run. It seems more like spyware than a health app. The same is true of the FitBit app — but to a slightly lesser degree. After the program was installed, I plugged the Up into my computer using the USB attachment cord (attached by wiggling off the metal tip on the Up bracelet to reveal a stem that looked like an earphone jack). Apparently the Jawbone “updater” program is just that – an updater. It offered no info or dashboard or direction beyond shutting down my browser to finish installing. On the “proper documentation” and “user friendly” front, the Up gets a C- in my book, possibly a D. When I unplug the Up from my computer, two green lights – one a flower looking icon and one a moon flash a few times. I have no idea what that means. Perhaps the android app will help me sort it out. The app helped… until it crashed. I also learned (before it quit responding) that I needed to take it off when I shower — something the Fitbit doesn’t require. When I started the app again, I had to sign in all over and re-pair the device again. The FitBit is easier to manage since I don’t have to take it off to shower. There is a HUGE difference in the measuring of steps. And it’s not always the same direction. Usually FitBit attributes more steps to my day, but sometimes UP does. It’s very confusing — and I’ve not measured to determine which one is accurate yet. I far prefer the sleep monitoring of the UP — it measures both “light” and “deep” sleep, whereas the FitBit only gives me sleep and waking measurements. I prefer the GUI (graphic user interface) of the UP over the FitBit. I also like the graphs and the added information that changes every day for the UP. I like the fact that the UP can be set to BUZZ (vibrate) to let me know when I’ve been inactive too long and that it reminds me with a persistent buzz when I forget to change from “sleep mode” to active mode. The FitBit doesn’t do that. I like the mood tracking on the Up — not something offered by the FitBit. The FitBit makes logging food much easier. I found the UP to be difficult, if not impossible to use to track my foods quickly and easily. Trying to adjust serving sizes and delete mistakenly entered food was beyond frustrating on the UP. 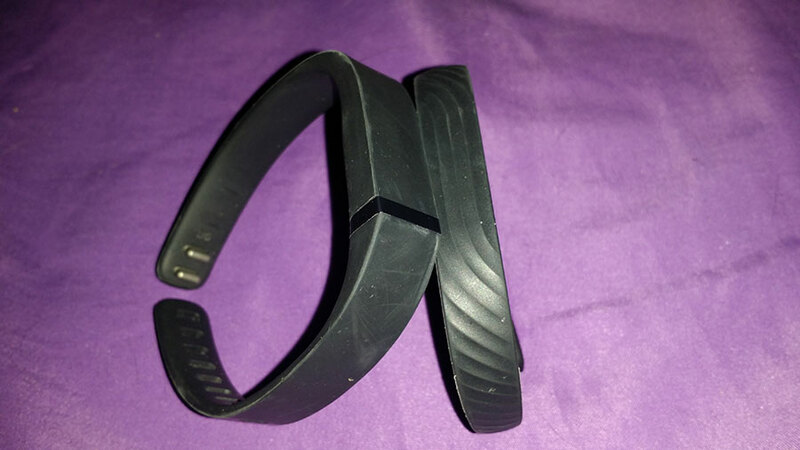 More programs and apps (online and off) sync and work with the FitBit than with the UP. 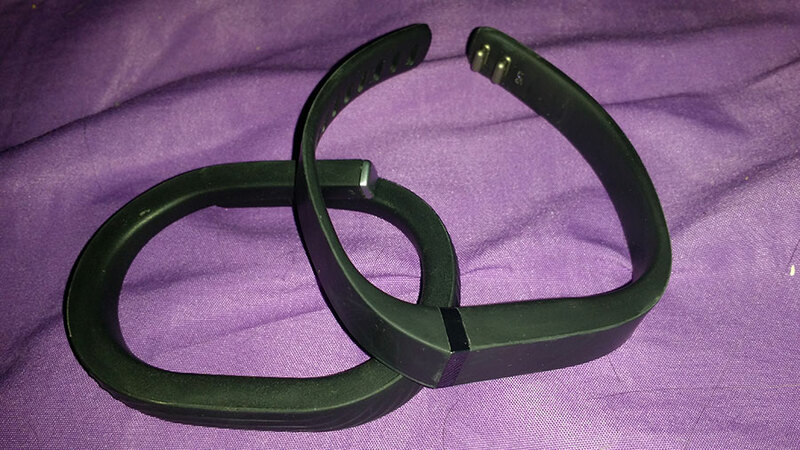 The battery lasts longer for the UP than for the FitBit and it requires less to charge – neither is difficult, mind you, but it takes a second to hook up the UP to charge, it takes longer to break down and charge the FitBit (and after a month, I still have to try several times before I get the FitBit into it’s charging cradle properly. (But, maybe that’s just me. I hate the hassle of having to remove the UP to shower. FitBit wins on the convenience on that front hands down. 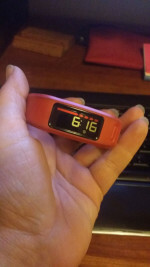 I like the option to get different colored bands for the FitBit. The UP isn’t interchangeable. The UP offers a “longest idle” and a “longest active” period on the display (which can be pretty telling!) whereas the FitBit only offers “very active minutes” measurement. The FitBit tracks water consumption, the Up does not. Calibrating the UP was easy and made it more accurate, but the FitBit continued to fluctuate. I’m not sure if it’s because I stand in one place and shuffle my feet a lot with my work (when I can’t tolerate sitting anymore) — or if, perhaps, the FitBit mistakenly registers standing up or shifting in the chair at my desk as a step. Overall, neither device is a silver bullet for my needs — and I’m not sure that device even exists –yet! But, I did enjoy the UP much more than the FitBit. If I selected non-smartwatch fitness band, it would be the UP — I would just hope to wait until they had a waterproof model. With that said, neither band is exactly what I’m seeking, so I will continue to look. 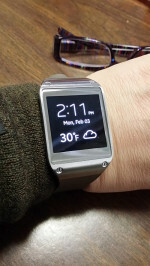 I’m too geeky to want a band that stays on my wrist all the time that won’t give me more information ON the device — especially something as simple as time and notifications of messages and calls, but I’m not a fan of huge wrist adornments either.